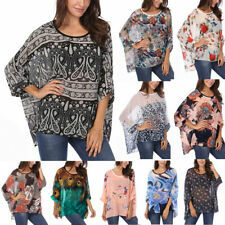 WOMENS SEMI SHEER CHIFFON BATWING BLOUSE TUNIC KAFTAN TOP COVER UP 1 SIZE. Condition is Used. Dispatched with Royal Mail 2nd Class Large Letter. 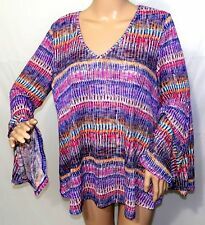 WOMENS ORANGE SEMI SHEER CHIFFON BATWING BLOUSE TUNIC KAFTAN TOP COVER UP 1 SIZE. Condition is Used. Dispatched with Royal Mail 2nd Class Large Letter. It is a lovely short sleeved cream top with a pretty floral pattern. It has a scoop neck and is a shell style top. 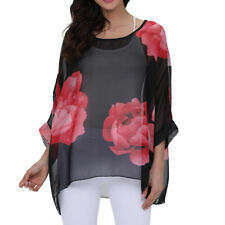 Very pretty chiffon party top from BM Collection in a size 18, chest 44ins, length 26ins. Lovely top, good condition elasticated hem , black necklace detail. Length 25 bust 25 label has been cut out think it’s Evans. 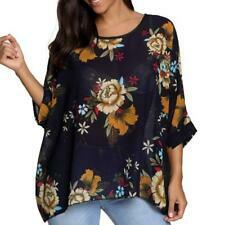 Floral Gypsy Style Top jumper chiffon By Apricot Large 14/16 bust 44"